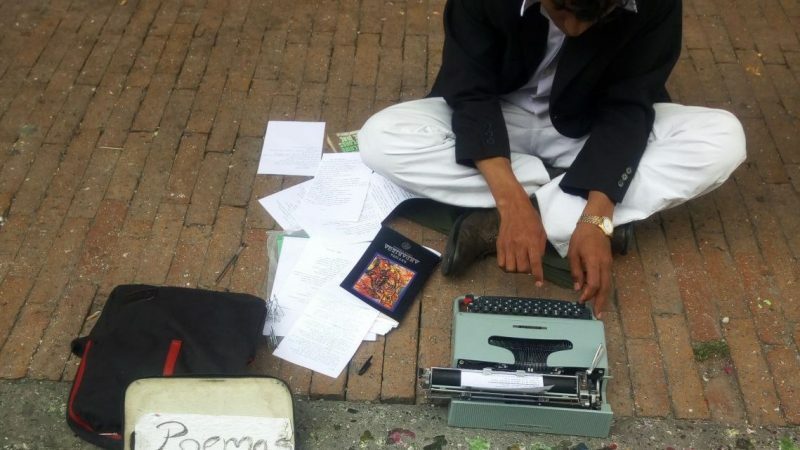 On March 10, street poet Jesus Espicasa sat with old his typewriter on a sidewalk in Bogotá, Colombia. A craft fair happened nearby and he thought it’d a timely occasion to sell his poems to passersby. The above story was told by renowned Colombian writer, and a friend of Espicasa, William Ospina on his March 17 column on newspaper El Espectador. The story made waves on Colombian social networks and sparked a nationwide debate about the role of poetry in public life. Espicasa went on to be interviewed by RCN Radio, in which he said that it had not been the first time he went through such an incident, nor was he the only artist to have experienced mistreatment by the police. “Public institutions push [the artists] into the streets and then treat them as criminals,” he said. Not only they [the artists] deserve a space in the city, they deserve a tribute by citizens and officials. Our authoritarian barbarism fines them and declares them criminals. In a country full of real criminality and devoured by corruption! […] Why do they call it a public space a space where they increasingly want to expel citizens, a space that they privatize when they want in a thousand different ways, where freedom is increasingly restricted and where expressions such as music and poetry end up being treated as crimes? Jail for writers and poets, inquisitive torture for translators of [our] collective consciousness, nobody wants it to be uncovered, with the bandage and the gag off. That would be leaving it exposed with the truth… and that is an attack on morality. Journalist Yolanda Ruiz Ceballos’ launched the hashtag #PoesiaALaCalle (#PoetryOnTheStreet), through which people were encouraged to share theirs or other people’s poems. # PoetryOnTheStreet Do not fine verses.